The Nokia 6340 is the first phone ever offered by Fido that has built-in analog capabilities. It finally gives them an integrated phone for subscribers that sometimes rely on extended coverage provided by the Bell Mobility and Telus analog networks. Technically, the 6340 is a GAIT phone. The acronym GAIT stands for GSM/ANSI-136 Interoperability Team. As its name implies, GAIT phones combine GSM and IS-136 (also called simply TDMA) in a single phone. As virtually all IS-136 phones also include AMPS (analog), so too do GAIT phones. Fido wasn’t interested in the IS-136 capability of the 6340, and in fact doesn’t use it at all since it has no roaming agreements with IS-136 networks. For Fido, it was the combination of GSM and analog that got their attention. This review is primarily concerned with the suitability of the 6340 as a GSM phone, though I will touch upon its analog abilities near the end. The phone looks a lot like the other 63xx series phones, but it appears to have more in common with the 6385 (CDMA) model than it does with the 6310i (GSM) model. It has virtually the same menu system and feature set as the other 63xx phones, which is a good thing. Its operating system is a direct descendent of the old 7190, but without the NaviRoller. In terms of size, the phone looks like it is rather tall, but this is an optical illusion created by the faceplate. The width and height of the phone are identical to the old 6190 and 5190 models, and the phone is only about a quarter inch taller than the Motorola P280, but with the same width. 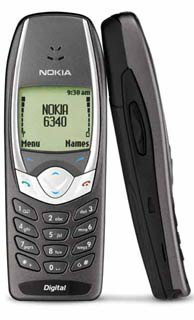 Also like the 6385, the battery is one of Nokia’s blocky internal types, like the ones originally used on the 3390. This makes it difficult to put a higher capacity battery in the phone, since you will also require a new plastic backing, assuming one is readily available. However, you probably won’t need a bigger battery, since battery life seems to be quite good as it is. The 6340 is completely compatible with all the accessories that work with the 51xx, 61xx, and 71xx series phones. The phone even snaps into the car cradles designed for those phones. That means that it will be relatively easy to find abundant OEM and after-market accessories for this model. Because it shares the same basic shell as the other 63xx phones, it has excellent ergonomics, though the keys on my test phone were a little loose. None-the-less, the keys were easy to reach, easy to press, and they provided good feedback. It should prove to be a great phone for SMS work, especially since it also includes Nokia’s excellent T9 implementation, and their user-definable SMS folders. Perhaps one of the most novel features on this phone, and one that is not available on the other 63xx models that I’ve tested (though I'm told it's available on the 6360 TDMA model), is a graphic equalizer. This feature allows you to change the tonal balance of the phone to suit your personal tastes. There are a handful of pre-defined equalizations, and two user-defined settings. By adjusting the level of boost or attenuation on 5 different sets of frequencies, you can create your own personalized tonal quality. If you prefer a tinny sound you can have it. If you prefer a muddier sound, you can have that too. The active setting can be quickly changed during a call with just a few keystrokes. I personally believe that this is a feature that has been a long time coming, and I hope that Nokia (and other manufacturers) put this sort of thing into all of their phones in the future. Sadly however, this great equalizer feature has been mated to an otherwise poor-sounding phone. Unlike the 6310i and the 6385, both of which have excellent overall sound quality, the 6340 sounds dull and hollow. No adjustment of the equalizer can mask the fact that it has a poor quality earpiece. Having said that however, I should note that it sounded okay during many of the real world calls that I was involved in during the test period. If you aren’t super-picky about sound quality, you can disregard the above rant. Unfortunately the audio problems didn’t end there. This phone has more Sidetone than any other I’ve yet tested. Sidetone is a practice of feeding back a sample of your voice to the earpiece. The idea was great on landline phones, since it gave you a sense that the phone was working. On mobile phones it is far less of a good idea, especially when used in noisy environments. Because of the amount of Sidetone on the 6340, using it in a car or a noisy shopping mall was a bit of pest. The incoming audio was mixed with an annoying background din that was actually a copy of the noise around you. While the din did not directly interfere with or damage the incoming audio, it simply made a bad situation worse. Audio volume certainly wasn’t a problem, courtesy of the equalizer. By creating an equalizer setting with all 5 bands turned up full you can amplify the audio level by a substantial degree, thus giving the phone plenty of headroom. Unfortunately the absolute maximum volume of the earpiece is not nearly as high as it could be. The earpiece clips too easily when loud sounds are present. RF performance is weird mix of excellence and mediocrity. When it comes to RF sensitivity for example, this phone is phenomenal. During tests over at Square One in Mississauga I was able to drag calls into places that even my P280 couldn’t go. Not only that, but it retained a solid connection with the network most of that time, and it wasn’t affected in the least by close proximity to my body. However, in real world situations the phone is rather uninspiring. In troublesome areas my P280 was able to produce far more stable audio. The 6340 just couldn’t seem to make up its mind what it wanted to do, and the resulting performance was mediocre at best. Analog performance was a bit hard to test, since the phone doesn’t allow you to force that mode. You have to wait until the phone looses the Fido signal. To do that I headed down to the underground parking garage at Square One. The switch to analog isn’t particularly swift, and the phone is literally unusable between the time it losses its ability to communication with the Fido network and the time it finally makes the switch to analog. Once in analog, it was loathe to switch back. I had to be in the digital coverage area for well over 5 minutes before the phone went looking for Fido again. The only way to speed up the process is to power down the phone and turn it back on again. Analog call quality was reasonably stable, but the audio quality was terrible. Granted, the analog network doesn’t sound that great to begin with, but I’ve tested other (non-GSM) phones that do a much better job of providing at least tolerable levels of analog audio quality. In the end therefore, I found the 6340 rather disappointing. Its hollow-sounding earpiece, lackluster analog performance, mediocre on-the-road GSM performance, and exceptionally loud Sidetone, were just too much for me to handle. Having said that however, it has the excellent Nokia menu system, lots of really useful features including the graphic equalizer, and it didn’t sound that bad in real life conversations. But, at $300 I’m not sure anyone can really justify the cost of this phone, unless they absolutely must have built-in analog.